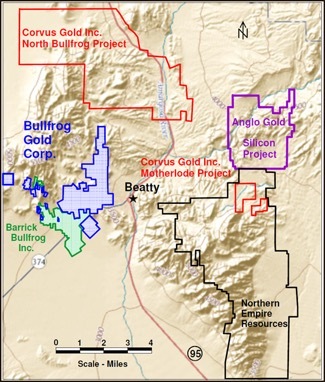 Bullfrog Gold Corp. (OTCQB:BFGC) (BFGC or Company) is focused on the exploration and development of its wholly-owned Bullfrog Gold Project in the politically stable and mining friendly jurisdiction of Nevada. Barrick Bullfrog Inc. produced more than 2.3 million ounces of gold from the area during 1989 to 1999. The Company has now acquired and established the commanding land and resource positions in the south half of the Bullfrog Mining District. The Project has a 2017 maiden NI 43-101 resource estimate of 525,000 ounces of gold in the measured & indicated categories at an average grade of 1.02 g/t gold, which is among the higher grade heap leach projects in the US. In February 2018, Bullfrog announced an increase in its land position through the staking of 21 mining claims and the acquisition of two patents, bringing its total to 187 mining claims, 46 patents and eight mill site claims over 4,330 acres. The Company is also updating environmental baseline studies and securing permits for drilling and further exploration. Subject to permit approvals and funding, drilling is expected to commence by mid-2018. The Company has obtained from Barrick a database that includes 155 miles of drilling in 1,262 holes, which today would cost more than $40 million to recreate. This information was used to upgrade a 2016 mineral inventory estimate into the 2017 NI 43-101 compliant resource estimate. Extensive metallurgical tests and two 800-ton pilot tests also demonstrates the amenability of these pit resources to low-cost heap leaching methods. Barrick produced 1.5 million ounces of gold from lands controlled by BFGC. 2017 M&I Resource Estimate of 525,000 ounces grading 1.02 g/t gold. Located in resource rich, mining-friendly Nevada. Highly experienced management with track record of success. Infrastructure in place includes power, water, pit haulage ramps and road access. Heap leach test programs achieved gold recoveries of more than 75 percent at a -3/8 inch crush within 41 days, and 54 percent at a simulated run-of-mine size of -12 inches within 90 days. BFGC’s market capitalization per ounce of mineralization is among the lowest of many peer companies having similar projects. 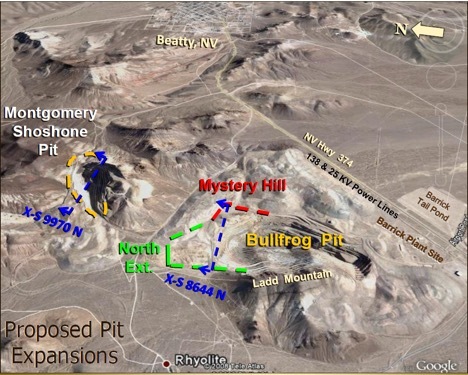 The Bullfrog Gold Project is located four miles west of Beatty and 120 miles northwest of Las Vegas, Nevada. The property covers 4,330 acres and includes the entire Montgomery-Shoshone (M-S) pit and the northern third of the Bullfrog deposit. Gold was discovered in 1904 and initial production by 1911 was 94,000 ounces of gold with an approximate ore grade of 0.5 ounce/ton. Modern exploration work conducted by St. Joe American in the early 1980s led to the definition of pit resources in the M-S deposit and discovery of the large Bullfrog deposit, which was placed into production in 1989. Barrick subsequently acquired the project in 1994 and by 1999 produced 2.3 million ounces of gold. Production from BFGC’s current properties totaled 220,000 ounces averaging 2.2 g/t from the M-S pit, 900,000 ounces averaging 2.5 g/t from the northern Bullfrog pit and 400,000 ounces at 7.5 g/t from the underground mine. For reference, Barrick did not use heap leaching and terminated production in the late 1990’s when gold prices were less than $290 per ounce. The table below summarizes resource independently estimated in mid-2017 by Tetra Tech Inc.
“The new resource estimates provide an excellent platform to develop the Bullfrog and M-S gold deposits using low-cost and efficient heap leach technologies,” said Beling. “The Bullfrog deposit is well defined and only requires minimal drilling to develop a final pit plan and test for resource expansions. In addition, the Company has identified several exploration targets up to three miles north, east and west of the current pits and is preparing permits for expansion and exploration drilling”. As part of the Company’s 2018 work on the property, the Company is working on acquiring drill permits to commence drilling by mid-year. The proposed drill program will focus on testing shallow mineralization on the patented lands within the M-S and Bullfrog pits and surrounding areas. Further on, proposed holes will target exploration areas away from the pits and deeper targets below the existing pits. The Company has also collected a 1,500-pound bulk sample from the northern Bullfrog pit to test the use of high-pressure grinding rolls in the third crushing stage to produce micro-fractures in a finer sized product. This is the first time Bullfrog samples will be tested using this technology. David Beling has over 54 years of experience in the base and precious metal and energy mineral sectors. He specializes in the development, financing and operation of projects and corporations. Beling has significantly reviewed or examined 88 underground mines, 131 open pits and 164 process plants. Initially, he was employed for 14 years by Phelps Dodge, Union Oil, Fluor, United Technologies, Westinghouse and employed or consulted for 39 years with 25+ junior companies. He has been a director of 14 US and Canadian public and private mining companies since 1981. Beling is a Registered Professional Mining Engineer – Arizona, where he drove approval of an Environmental Impact Statement in 1993, the first for a mine in the state. Alan Lindsay has been responsible for developing the strategic vision for placing key mineral assets into Bullfrog Gold Corp. He is a founder or principal of AZCO Mining Inc., Uranium Energy Corp., Anatolia Minerals, Oroperu Minerals and Strategic American Oil. Kjeld Thygesen has 46 years of experience internationally in the mining research and finance sectors, specifically in precious metals. Currently he serves as an investment manager at Resource Development Partners. Thygesen has held various positions with NM Rothschild & Sons and was an international mining research analyst at James Capel. He served as a director of Ivanhoe Mines between 2001 and 2011. Tyler Minnick is a registered member of the Colorado Society of Certified Public Accountants. He has over 24 years of accounting, auditing and business advisory services experience. He is also specialized in financial reporting and budget preparation and analysis. Clive Bailey has 42 years of experience in exploration, evaluation, development and operations and closure. He has managed the drill programs on two projects formerly owned by Bullfrog. He is a past employee of Nord Resources, General Minerals, Harvest Gold, Pegasus Gold, Energy Fuels Nuclear and Cotter Corp. He also managed the 13,000-tonne-per-day Buffalo Valley gold mine in Nevada. Tom John has 44 years of experience and was the Barrick Bullfrog’s Exploration Manager from 1995 through 1997. Mr. John has been advising and consulting for Bullfrog Gold from 2011 through the present. Joe Wilkins has 52 years’ experience in the global resource industry and is credited with the discovery of the 3 million-ounce Bullfrog deposit mined by Barrick. He was a former geologist with Occidental, Duval, Gulf Mineral Resources and St. Joe American. *Disclaimer: The profile provides information which was sourced and approved by Bullfrog Gold in order to help investors learn more about the company. Bullfrog Gold is a client of the Investing News Network (INN). The company’s campaign fees pay for INN to create and update this profile page, to which links are placed on Investingnews.com and channel newsletters.